An expert witness in workers compensation and public liability court cases says Australian employers and public building managers face potentially huge payouts and even jail if they continue to underestimate dangers posed by slip and fall accidents. Mr Michael Siegle says that – despite such accidents accounting for 20,000 new workers compensation cases each year – many employers and owners continue to focus mainly on above-ground safety. “Safety measures such as signage, protective clothing, safety glasses, hearing protection and helmets are all very worthy in their own right, but they count for little if a worker or customer slips over on a damp or greasy surface. You can be all dressed up for safety but you will still break your bones or strain your back if you fall over. As a country, we seem to have something of a blind spot for underfoot safety, ” says Mr Siegle, whose testimony is regularly tendered to courts in public liability and workers compensation cases. Sprains or strains of joints or adjacent muscles now account for more than 50 per cent of new workers compensation cases recorded by the National Occupational Health and Safety Commission, says Mr Siegle, who is Managing Director of the General Mat Company, which distributes some of the world&apos;s leading types of ergonomic, anti-fatigue and safety matting. He said one recent successful prosecution involved the proprietor of a public building who had maintained safe underfoot conditions until a visitor came in from the rain and spread water about the floor. “Despite the fact that the accident victim brought in the water upon which she subsequently slipped, the judgement said the building owner was liable because he should have provided flooring that provided for this contingency. “It might not sound very fair, but this type of case is going to get much more common in Australia as we follow the US model, where the 25,000 slip/fall accidents reported by the National Safety Council in the US are costing that country about $US3.5 million dollars an hour, or $US30 billion a year – which is more than the Australian Federal Government spends on health, education and welfare combined. “Much of the expense involves public liability and a significant part involves workplace claims. This is a grim warning to Australia, because our population aging profiles are following theirs very closely - and so are our public liability and workplace liability claims, says Mr Siegle, whose company represents leading international brands of safety, anti-fatigue, entrance and ergonomic matting, supplied by the Tennessee Mat Company and The Andersen Company, whose products are designed to prevent claims. 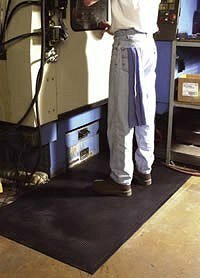 The General Mat Company has subjected several of its top selling products to independent CSIRO testing to demonstrate their safety. A customer visiting a fruit shop where grapes were displayed at a slight angle, causing some to fall onto the floor where the customer slipped upon them. Counsel for the injured woman told the court that fruit shops were prone to such problems and could have anticipated them by providing anti-slip mats that were grease and chemical-resistant. A visitor to a service station who slipped on water brought onto its hard floors by customers coming in from the rain. The court was told such problems could reasonably have been anticipated by providing entrance matting of a type designed to absorb water and mud. The absence of such matting was a failing common to both public buildings and workplaces, said Mr Siegle. A customer leaving a restaurant who slipped on fat and oil that had accumulated outside on a brick paved area. Counsel for the woman – who broke her arm – said it appeared safety of the restaurant user could have been enhanced considerably by the use of a mat immediately outside the door where people could wipe their feet upon entry and which would absorb any oil trodden into the area when people left. The case showed safety doesn’t stop at a business’ front door, said Mr Siegle. The latest figures from the National Occupational Health and Safety Commission (NOHSC) show Australian industry now has well over 20,000 new workers compensation cases a year where falls, slips and trips result in death, permanent disability or a temporary disability resulting in an absence from work of more than a week. Such cases are inextricably linked with the safety of floor surfaces, says Mr Siegle, noting that the slip resistance of any surface is determined by the Coefficient of Friction (COF) on the surface. The COF is the horizontal force divided by the vertical force. The higher the coefficient of friction reading, the less slippery a surface. “Coefficient of Friction has become an important measure of performance for floor surfaces and to the anti-fatigue and safety matting industry. To guard against slip and fall accidents, the American OSHA recommends a static coefficient of friction of .5. The Americans with Disabilities Act (ADA) specifies a coefficient of friction of .6 on flat surfaces and .8 on ramps.